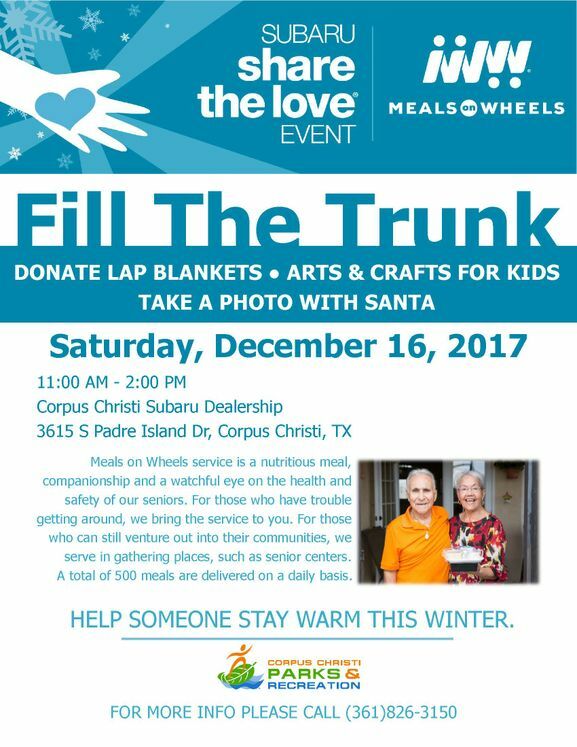 CORPUS CHRISTI, TX - The public is invited to attend the "Fill the Trunk" event, a fundraiser for the city’s Meals on Wheels program, Saturday, December 16. Attendees are asked to drop off lap blankets which will be handed out to seniors taking part in the program. There will also be arts and crafts for kids and pictures with Santa. Many local senior citizens take advantage of the Meals on Wheels service which provides hot lunches at all eight senior centers and home delivered meals to home-bound elderly individuals. A nutritionally balanced, dietitian certified lunch is served Monday through Friday. The event is taking place Saturday, December 16, from 11:00 a.m. to 2:00 p.m. at the Corpus Christi Subaru Dealership located at 3615 S. Padre Island Drive. As a member of Meals on Wheels America, the City’s Meals on Wheels program is proud to participate in Subaru USA’s annual Share the Love Event to help raise critical funds needed to support our local seniors. When you buy or lease a new Subaru this holiday season, we hope you’ll choose Meals on Wheels as the recipient of a $250 donation. For more information, please call (361) 826-3150 .